Dustin, Susan, and Fiona with Dustin’s Aunt Linda on 26 February 2011, a week before Linda passed away. I want to talk about my sister’s life. She was a sister, a mother, a grandmother, a wife, a cousin, and an aunt. Linda was born 27 November 1949 at the Army hospital at Fort Bragg, North Carolina. Today it’s named Womack Army Hospital. Rory and I were also born there. Carl was born in Eden, and Tania was born in Fayetteville at Cape Fear Valley Memorial Hospital. The first time I saw Linda the family lived in Corn Bow near Fort Bragg. She was special then and she was always good to me. I remember when she was only nine years old she earned money babysitting so she could buy Timex watches for me and Carl for Christmas. I was only six. It was then that I realized how kind and thoughtful she was and she has been that way ever since. We were Army brats. We all moved together from place to place: Fayetteville; Fort Hood, Texas; Florence, South Carolina; and Germany twice. It wasn’t easy for any of us always being the new kid in the neighborhood. Linda loved family. One of her favorite things to do growing up was going to stay with Grandma Joyce and Shelby Jean for the summer. That was the happiest I ever saw her as a child. I remember her teaching me how to catch lightning bugs when I was only five. We put them in a mason jar and would try to use them to light our room. We lived in Fayetteville at the time and Carl, Linda, and I shared a double bed. When we lived in Florence, Linda changed her name to Frankie after playing the part in her high-school play, Frankie and Johnny. Linda was a wonderful person who touched a lot of lives. She unselfishly helped me and many others including many of you here today. You know who you are. All she wanted in return was your love—nothing else. In her younger years Linda always went to church. She encouraged me to go along with her but she never put any pressure on me. She somehow made it seem fun and important for me to go along. She would always share with us whatever candy she had, but we weren’t so generous. One day she decided to give us a taste of our own medicine. When she didn’t share, I started singing the song that I had learned in church: “Share with one another….” She felt guilty and relented. She was always a pushover. She’s the reason that I believe in Christ as my Savior and I know that she is in heaven today. And I thanked her for that when I said goodbye to her as she lay near death in the hospital. I said I’d see her on the other side. As I said before, Linda always wanted to help people. She was a Candy Striper volunteer at the dispensary when we all lived in Amberg, Germany. She work as a medical assistant for many years before becoming a licensed practical nurse in 1979 and then on to become a registered nurse in 1983. She then became head nurse at High Point Regional Hospital. She was very proud of that and we all were, too. Linda does not want to let her illness define her. She fought hard for her life all the way to the bitter end. Although she suffered many hardships she persevered. She would have made the perfect pioneer wife. The first horrible hardship was the loss of her firstborn child, Dougie. I lived with Linda, Dougie, and Jamie in Aberdeen, Washington, at the time. Dougie was only two and Jamie was an infant. I will never forget that day when he was run over by a truck at his Grandpa’s gas station. It was a terrible day. The loss of a child is the worst possible thing that can happen to a parent, especially a mother. It was a terrible day. She suffered, yet Linda rebounded and continued to show her love and care for all those around her. Fourteen years ago, on her way to work one night to pull her graveyard shift at High Point Regional Hospital, she was stricken by a stroke. The stroke ended her career as a professional nurse although she never stopped being a nurse. It was a career she dearly loved because she could help people and get paid for it, too! Three years ago, she was diagnosed with interstitial lung disease. It is a terminal decease that kept her on oxygen 24/7 but she kept fighting, hoping for a lung transplant. A month ago she was at home alone on a normal day. She passed out, fell, and cracked her back in two places. This proved to be the final blow. We all watched as she struggled and fought to the end. Linda has left behind many people who cared for her dearly. All of her family and all of her friends will miss her dearly, especially her doctor, Dr. Kim. Can you imagine being so lucky as to have Linda as a sister? 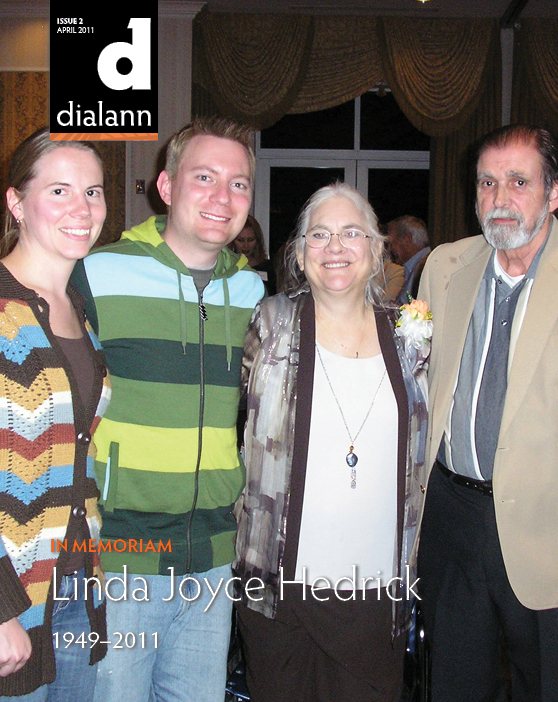 This is an edited version of the eulogy offered at Linda’s memorial service on 9 March 2011 in Greensboro, North Carolina, by Bryan Joyce, Dustin’s uncle and the older of Linda’s two younger brothers. Read the obituary for Linda that ran in the News & Record in Greensboro, North Carolina, on 7 March 2011.